If taking on the streets is the name of the game, nothing does it better than the new Triumph Speed Triple S. The new Speed Triple S is more than just a force of nature; it brings unmatched performance, character, style, quality and practicality where it matters – on real roads, in real riding conditions. The aggressive silhouette of the new Speed Triple S houses our acclaimed 1,050 cc triple engine, tuned to deliver a fist full of linear torque for real-world thrills and top-end performance. It is housed in a chassis engineered for rider engagement and is packed with the latest rider technology. Building on its legend as the original factory street fighter forged 21 years ago, the new Speed Triple S truly has come of age. 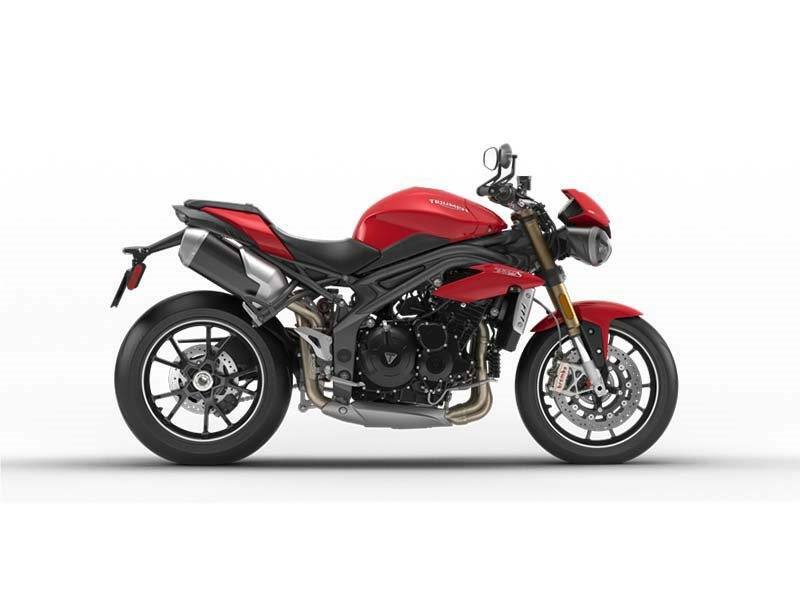 CHASSIS: The new Triumph Speed Triple has agility, stability and engagement at the heart of its handling characteristics. With its dynamic and refined ride balanced by a bold, aggressive attitude you will find yourself looking for excuses to take the long way home for maximum fun and maximum thrills. SUSPENSION: The new Triumph Speed Triple has agility, stability and engagement at the heart of its handling characteristics. With its dynamic and refined ride balanced by a bold, aggressive attitude you will find yourself looking for excuses to take the long way home for maximum fun and maximum thrills. 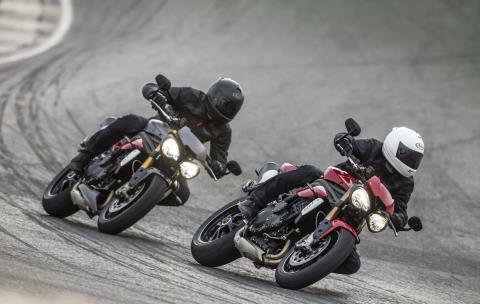 WHEELS, BRAKES, AND TYRES: For the ultimate in stopping power, the new Triumph Speed Triple S and Speed Triple R both use radial Brembo monobloc calipers, gripping 320mm discs, in conjunction with switchable, selectable ABS. 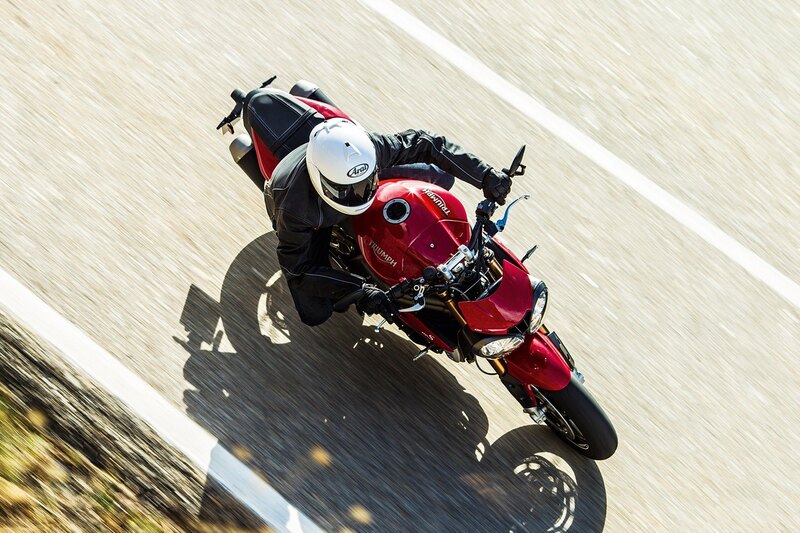 Adding to all-round braking performance and balanced high-grip and durability, both Speed Triple S and Speed Triple R use Pirelli Diablo Supercorsa tyres running on light, cast aluminium wheels. FRAME: For the ultimate in stopping power, the new Triumph Speed Triple S and Speed Triple R both use radial Brembo monobloc calipers, gripping 320mm discs, in conjunction with switchable, selectable ABS. 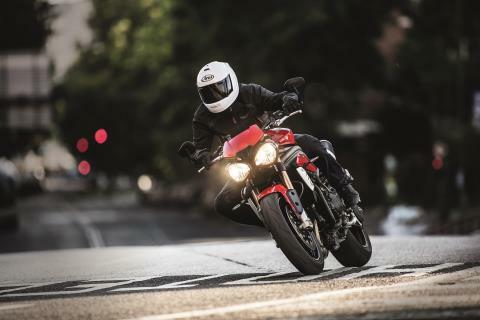 Adding to all-round braking performance and balanced high-grip and durability, both Speed Triple S and Speed Triple R use Pirelli Diablo Supercorsa tyres running on light, cast aluminium wheels. ENGINE: Our all new 1050cc triple engine incorporates 104 new developments that deliver More Power, More Torque and More Responsiveness, where the merest twist of the ride by wire throttle delivers an instantaneous wave of torque and a truly heart thumping surge of acceleration. Our all new 1050cc triple engine incorporates 104 new developments that deliver More Power, More Torque and More Responsiveness, where the merest twist of the ride by wire throttle delivers an instantaneous wave of torque and a truly heart thumping surge of acceleration. New ride by wire throttle bodies, new ECU, new cylinder head design, new combustion chamber, new header design, new fuel delivery system, new slip assist clutch, new crankshaft, new airbox… equals an all-new engine with a smaller, narrower profile and delivering the ultimate road riding experience. A guaranteed thrill for anyone who rides it. RIDING AND HANDLING: For the ultimate in stopping power, the new Triumph Speed Triple S and Speed Triple R both use radial Brembo monobloc calipers, gripping 320mm discs, in conjunction with switchable, selectable ABS. Adding to all-round braking performance and balanced high-grip and durability, both Speed Triple S and Speed Triple R use Pirelli Diablo Supercorsa tyres running on light, cast aluminium wheels. HANDLEBAR CLAMPS AND RISERS: Exclusive to the new Speed Triple R, outstanding attention to high quality detail is evident immediately when you reach for its handlebars. The wide alloy bars are held by a pair of clamps and risers exquisitely machined from a solid aluminium billet, designed for style, engineered for substance. MUDGUARD AND TANK INFILL PANELS: Exclusive to the new Speed Triple R, outstanding attention to high quality detail is evident immediately when you reach for its handlebars. The wide alloy bars are held by a pair of clamps and risers exquisitely machined from a solid aluminium billet, designed for style, engineered for substance. TWIN SILENCERS: The new Triumph Speed Triple’s seat is a separate two-piece design, focussed to deliver the best individual shape for comfort. The rider's seat has 20mm narrower front profile which aids control and improves ‘stand-over’ but is also now wider and more supportive at the back making it even more comfortable. The Triumph logo is embossed on the leading edge of the pillion seat, giving added conspicuous detail. RIDING MODES: The all new under seat exhaust system is not just a thing of beauty, it is lighter than its predecessor, 70% freer-flowing and tuned to unleash the rich characterful roar unique to a Triumph triple engine. RBW THROTTLE: The new Triumph Speed Triple features a ride-by-wire throttle that interprets grip position for more instant and accurate throttle response and control. It also has the added benefit of improving engine efficiency and fuel economy compared to the previous model. SINGLE SIDED SWINGARM: More than just a signature styling characteristic, the new Speed Triple’s single-sided swingarm is engineered to optimise handling stability – not to mention making it easier to clean the rear wheel, or remove it when changing the rear tyre.